Ancient seagrass (aka neptune grass) is believed to be tens of thousands of years old and yet it may be at threat for extinction as a result of climate change. In this article we take a dive deep below the sea to find out what’s growing on the ocean floor and to better understand the most recent findings in regard to this ancient oceanic organism and its importance. Sea grasses are a group of flowering plants that belong to a number of different plant families including: zosteraceae, posidoniaceae, cymodoceaceae and hydrocharitaceae. Every plant in the sea grass group belongs to the order Alismatales and they all demand salt water environments to thrive. For the purpose of this article we will be looking at Posidonia oceanic (aka neptune grass). Posidonia oceanic is a member of the family Posidoniaceae. There are a number of species of sea grass in the Posidoniaceae family including: Posidonia angustifolia, Posidonia australis Hook.f., Posidonia coriacea, Posidonia denhartogii, Posidonia kirkmanii, Posidonia oceanica (L.) Delile, Posidonia ostenfeldii, Posidonia robertsoniae and Posidonia sinuosa. This particular family of neptune grass is found in the Mediterranean sea. Posidonia oceanic is more commonly known as Neptune Grass or Mediterranean tapeweed and grows in large meadows that play a significant role in the Mediterranean ecosystem. Posidonia oceanic grows in tufts of grass that are around five feet long and can grow in depths of water between 3.3 to 115 feet deep. What is the Significance of Posidonia Oceanic? Researchers have found a number of samples of Neptune grass that sit as far as nine miles apart but are identical genetically. This means that the Posidonia oceanic is a particularly long living species. While this neptune grass is a long living plant, researchers now have concerns that the grass now faces a threat from the climate changes taking place. Neptune grass is known to be able to reproduce sexually, through cloning or asexual reproduction. Asexually reproduced Neptune grass carries the identical genetic information that was carried in the original grass plant which is what researchers are looking at. These wide-spread samples of Neptune grass are interesting not only because they are asexually reduced but because they indicate that there is no degeneration in the cloned copies of Posidonia Oceanic. Further, research indicates that Neptune grass is a particularly long living plant and as such this indicates that this plant has been able to adapt over time. Why does the Survival of Neptune Grass Matter? The age of Neptune grass indicates that, not only has Neptune grass been able to adapt to a variety of conditions, but it is also indicative that it has been able to survive a number of conditions. When Neptune grass sections were believed to have begun their growth the ocean waters were much cooler than they currently are. The ability to begin growth in cooler waters and continue growing in warmer waters points to the hardy nature of the plant. The question that comes up now however, is that if neptune grass has been able to withstand climate changes in the past, why does it seem to be struggling now? While the Neptune grass in question in this particular research study has shown the ability to adapt to slow changes in climate, there seems to be problem when it comes to the rate at which the climate changes. The current rates of climate change are taking place at such a significant rate that the neptune grass meadows are simply unable to keep up. The growth rate of the Neptune grass species is so slow that the cloned plants are able to grow in to the slow going changes that take place in climate. When the changes in climate take place at a much faster pace the slower growing Neptune grass is unable to adapt at a fast enough pace to sustain the changes that are taking place. 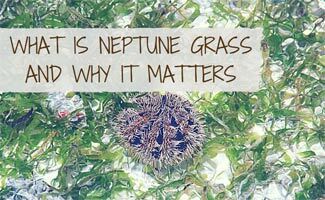 What Does Disappearance of neptune grass Mean? So why should we care if neptune grass is unable to keep up with the current rates of change in the ocean’s climates? If the rates of climate change do not slow down, then there is little hope that the long living neptune grass species will be able to live much longer. Not only will existing plants die out from extreme temperature changes, but the plants will no longer be able to reproduce and the neptune grass species in question will simply die off. Why should it matter if the oceans no longer have a healthy neptune grass population? Neptune grasses are playing a number of important roles in the oceans of the world. The large meadows that these grasses grow in provide large meadows that many marine animals utilize as feeding grounds and as a means of camouflage from larger predators. Neptune grasses of all kinds provide rich ecosystems that sustain large numbers of species. Hundreds of species from a number of different marine life groups depend upon neptune grass as an ecosystem and a place to prey upon other species. Recent research reveals that a number of species feed directly on neptune grass. Previously, it was believed that no species fed specifically on neptune grasses but now researchers can confirm a number of species that do feed upon neptune grasses either exclusively or, in addition to other food sources. Some of the creatures known to feed on neptune grass include: dugongs, manatees, geese, fish, sea urchins, crabs, fish and green turtles. If the neptune grasses of the world begin to fade away as a result of sudden climate change there is no telling just how much damage will be done. Not only will a number of species have no source of food, but the disappearance of neptune grasses also indicates that the ocean waters will also take a hit. Neptune grasses are believed to hold some 15% of the carbon stored in the world’s oceans and without those neptune grasses carbon buildup is likely to damage entire ocean ecosystems. In this five-minute video, Dr. Michael Rasheed, Principal Research Scientist from the James Cook University’s Centre for Tropical Water and Aquatic Ecosystem Research (TropWATER) talks about their sea grass monitoring program off the coast of Australia. Their efforts have advanced the research and is helping to find ways to grow and sustain sea grass in the future. What’s your take on global warming? Do you think neptune grass is at threat of extinction? Is it Possible to Be a Carbon-Neutral Town? Doing research for a school project about climate change and found this article helpful. Will reference it in my paper. Thank you!